This amazing wood cleaner and restorer takes old shabby dull wood and completely revitalizes it. This product is not like a lemon oil, Touch of Oranges is a cleaner for wood! No residue left behind! It is a moisturizing orange cleaner made with orange oil. Protects against drying and cracking and contains no silicone or wax which can cause buildup. Wood surfaces treated with Touch of Oranges glow like they are brand new! Hardwood Floors: Spray the bottom of a dust mop or Micro Fiber Mop once or twice and dust the surface of the floor. No slippery surfaces from wax or silicone residue! 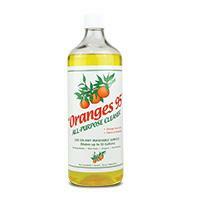 Once every two weeks damp mop with the Oranges 95' to remove any build-up dirt or spots. Try to keep the water off the floor as much as possible.